Nintendo of Japan has released four new advertisements showcasing the many strengths of the Nintendo Switch. As usual, the marketing message is on point and these will likely play quite well with their target demographics. The first advertisement focusses on Nintendo's unique games on the Switch, such as Pokémon: Let's Go, Pikachu! and Let's Go, Eevee!, Super Smash Bros. Ultimate and Mario Kart 8 Deluxe. These are experiences which you won't get anywhere else – that seems to be the message here. The other three ads focus less on the games and more on the versatility of the Switch. One shows a young lady getting a bit of much-needed chillout time to herself gaming on a long coach journey (try doing that with Google Stadia when you go through a tunnel), while another ad depicts family time with a father and son. When the little nipper eventually nods off, the dad gets a bit of time to play the game he wants to on his own. 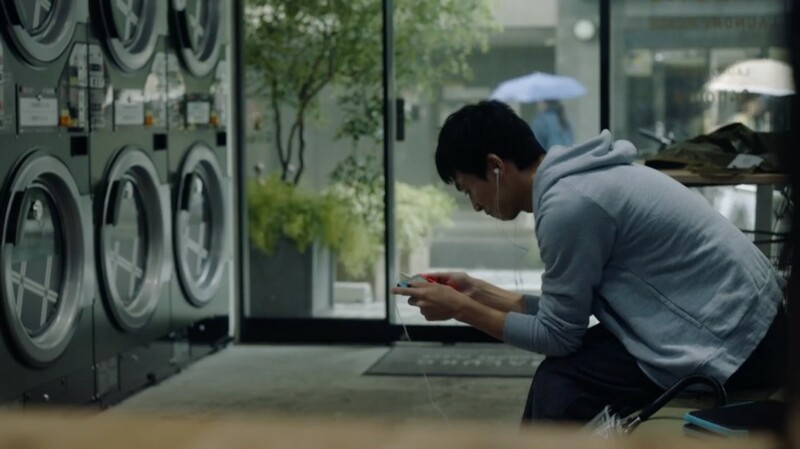 The last advert shows how the Switch can be used to pass away the time in a laundromat, which let's face it, has to beat washing your soapy undies going around in circles for an hour. Again, this commercial shows the appeal of Nintendo's approach; Stadia may be stealing the headlines now, but can you really hope to get a decent WiFi signal down your local laundromat? Let us know what you think of this Japanese advertising campaign with a comment below. Would a simpler tone work for marketing the Switch in North America and Europe, given that cloud services like Stadia are going to be seen by many as the future of gaming? The switch is such a gem. I hope its concept stays for the future! Stadia is targeting different players. I too prefer offline gaming but people need to understand that Stadia is not for everyone. After the “disaster” that was the Wii u’s original advertising and informing to the general public, I can see how Nintendo wanted to ensure the message of the Switch’s abilities had to be clear and concise in its advertisements. I do wish they’d show off more games; then again Nintendo will always want to show off its current major titles. As for Stadia; I do acknowledge that like TV and Music I do see streaming becoming an important source for gaming as many people are willing to take a hit on ownership for convenience or utilise the subscription model. However it will take longer to make an impact in the portable market plus I do see traditional gaming living on a little while longer even if it becomes a little more niche. @FX102A I had a conversation with someone the other day and we both agreed that the Switch is everything the public presumably thought the Wii U is going to be. Even with Wii U's TV less function, it was still better you are hooked to the main console and close to it (pref. the same room). What I really hated sometimes was that some title let you play off TV, but some titles did not allow that. If anything I can see Stadia enhancing Switch's popularity. I'm sure Sony and Microsoft will be getting a bit twitchy but only Nintendo is offering anything truly different to Google. Plus if Stadia really does take off it's not beyond the realms that a future version of the Switch could run the Chrome app and offer the best of both worlds. Would compliment Google's plans perfectly. Stadia will offering games for adult contents only, not fun at all. Secretly Nintendo is leaning towards cloud streaming, it's the only solution to beat piracy. Stadia will only work if you have a good internet connection, therefore, would be pointless for me as Guernsey's internet drops out if it rains. @christ15 So you're saying that games for adults can't be fun? Games consoles don't always have to provide the same experiences or target the same demographics. It's great having the variety to choose a console that best meets OUR needs and interests. I'm happy for Nintendo to say "this is what WE do" without feeling the need to come up with their own version of what others have opted for. Well, with Google Stadia you don't have to watch loading screens all the time! Take that Switch..! All I learnt from these videos is that I was pronouncing my favourite console the wrong way. It is Nintendo SWEETCHEE. @FX102A plus gaming via streaming will risk always running into one specific hurdle in America on mobile SMS that's the data caps many mobile plans suffer from that limit anything intensive to when one has access to a wifi network. @Octane Because all internet connections are always fast enough? @Octane lol🤣🤣🤣🤣 I hear that. I bet you: Google will stream many games for free in exchange for ads. You will watch a 1 min commercial every 20 mins of gaming, and you play for free. While I definitely think the Stadia concept is rather impressive - I just don't think we are quite there yet. Digital Foundry has a video talking about the current performance of Stadia. On a 200Mbps Wifi connection, there is a 166ms lag from controller input to action finally displaying on screen on Assassins Creed Odyssey - which matches the Xbox One X version (not bad, really). A 15Mbps connection saw a drop to like 188ms or something. This seems to suggest that Stadia is still best played on a home network. There is also a disparity in picture clarity, since, you know, streaming and all that. Audio is also compressed, because, again, streaming. So, while I think the Stadia concept is neat, I still think gamers will prefer that pristine audio/visual/controller experience of dedicated hardware. However, where I think the Stadia concept DOES make sense is if someone like Nintendo creates a powerful dedicated home console, but offers a Stadia-like option (using Cloud saves) when away from home (or for people who want to play Nintendo games, but can't afford the hardware for a dedicated TV experience). We can still have that Switch-like experience of games on the go, but we also have that uncompromised experience on the TV. It could be something that ties into an online subscription. I could see a controller that has a Bluetooth connection to the console when home, but also uses the Wifi Option like Stadia when away from the console. I know Sony has Remote Play over the internet, but that solely relies on going back to your original hardware, which can really hurt performance. It was a good start, but being able to run from a regional server is tough to beat! Bottom line: I think gamers would be happy to have something like Stadia as an option, but would still like to have dedicated hardware for their fancy TV's and home theater systems. Also, Stadia will not be a Switch killer. @NintendoFan4Lyf Nintendo can prolong the life of Switch with similar cloud streaming. A few years down the road, cloud gaming will be the norm and adding this feature to Switch will make it last forever. They already beta tested with Capcom in Japan. In the future it could be worldwide. Does Stadia have Pokemon games ? @Bunkerneath According to Digital Foundry's analysis, 15mbps Internet speed should be enough for 720 60fps, 25mbps+ for 1080p. Since the controller connects directly to the server rather than the device your playing on, lag is minimal. It says for most people, 1080p will be the norm and image quality won't be comparible with the consoles but the hardware powering the games dwarves the consoles. It seems Google have the technical part figured out. It's all going to come down to the games. Google Stadia is truly some cool future music, I think cloud gaming is going to be the future of gaming. As of now, We will wait and see how well it’s going to perform. Also I wouldn’t be surprised if stadia is going to be compatible with the Nintendo Switch. Sony and especially Xbox have to watch out because remote play and Xbox’s cloud gaming service are in deed in danger if this really takes off, not Nintendo per se. @nintendolie True, but unless Nintendo goes "all-in" on the streaming service and invests in a global Stadia-like infrastructure, they would need to partner with someone to make it a viable option. Google, Amazon, and Microsoft are the three right now that have that kind of server infrastructure with a global reach. With all the Microsoft/Nintendo partnership rumors flying around, it could become a possibility one day. The issue really lies in the financials. I love my Switch and it brought gaming back into my life after a LONG time without it. It fits into my world, goes anywhere I go, and gaming can fit into my crazy grown-up parenting life with ease. I'm gonna stick with it cause I don't have the time for multiple consoles, or really the desire to own them, and because it has brought me so much joy. I'm not concerned with being able to play every game out there, I enjoy the experiences that the Switch is providing and with a backlog approaching 400 games I'll really never "need" another console again. Fine by me. Taking a sh*t while playing the Switch is an experience I don’t want to miss. "(try doing that with Google Stadia when you go through a tunnel)"
That guy’s doing the laundromat all wrong. You’re meant to strip down to your boxers then sit and read a magazine while looking a bit sweaty. I probably wouldn't have bought a switch if i weren't a father of a young child Nintendo has got me figured out. I was thinking that you of all people would appreciate the move to Cloud gaming. Cloud gaming as an option seems ok. Cloud gaming as a permanent replacement will see me bowing out of gaming altogether. It just manufacturers channeling us down this route so we fall in line with paying annual subscriptions for heaps of software we never ever really own. I resent and refuse to pay hard card for virtual product. Once I buy virtual/streaming entertainment.... I own.... nothing. Switch physical releases have been the best reason to get back into physical game purchasing before it was too late. Seems maybe it was too little too late. Great summary of why my Wife and I love the switch... it "fits" into our adult life so we aren't tethered to TV. Love the SLEEP and PAUSE anytime function. I can actually make progress in RPG's again! @HAL9000 Thanks man! Yeah, that's us too. It's been fantastic and I love the console so much that I'm completely unconcerned with all this Stadia/PS5/Microsoft stuff...I'll be sticking with the Switch cause it just 110% works for my life. I don't think I've ever gotten this much joy from gaming, and i'm an 80's kid lol. As most have turned this into a discussion of Stadia vs "traditional consoles"...I'll give my take on the commercials themselves. I think they are great. Short...but sweet and to the point: play games on Switch ANYWHERE and with ANYONE. I also really like how the only spoken words in the commercials were just "Nintendo Switch". I don't exactly know how...but it really gets the point across to me, just having those simple words spoken at the very end. Nintendo has REALLY turned around in the advertising department since the Switch launch. @Fake-E-Lee @HAL9000 Couldn't agree more. Prior to Switch, I played almost all of my games on PC during the rare time I had free, and my Nintendo consoles were pretty much only for party games when I had friends/family over. The Switch changed all of that, and being able to pick up, play, and suspend whenever I want without fighting the wife or kids for the TV makes it so much easier for me to progress in 5-10 minute increments (With frequent interruptions) and still have a great time. I find myself playing far more games on my Switch than I ever did with previous consoles. Please don’t misunderstand. I don’t take myself too seriously. But it was meant with honesty: Due to an illness it’s very comfy to be able to continue gaming, even when I have to leave the living room. I love how Cloud streaming fandom keep talking about Switch going Streaming Cloud. Now you have to ask if Cloud was that good why would they need a Switch. That tells alot if they must use Switch in the same line as Cloud. This only means one thing Cloud is dead. Cloud is junk when ISP is junk so tell me again whom is making you pay twice to play. Give me Switch.....oh let's go back gaming Switch. I don't think Nintendo needs to compete with streaming, at least not at the same level as Google and Microsoft. Just like these commercials show, Nintendo's strength is in sidestepping the mainstream console/streaming race altogether and focusing on quality gameplay moments you can't get anywhere else. The Switch hardware used to be enough to distinguish itself in 2017 and 2018, but moving forward, Nintendo will have to work even harder to forge its identity with its exclusive software (not to mention that the Switch still maintains its novelty as an offline mobile game player). If the price is right and the latency is almost the same as traditional consoles within a reasonable threshold of bandwidth, then I could see myself choosing a Stadia subscription over, say, a future Netflix/Hulu/Disney+ subscription, especially since I would enjoy dipping my toes into AAA/third party games without having to commit $60 apiece. I believe this is where Google is truly trying to compete, by biting off portions of both streaming audiences and the tens of millions of Fortnite-esque mobile gamers who want to jump right in without large barriers of entry. As convenient as it would be for someone like myself to enjoy Stadia on my console of choice, I believe two things hold Nintendo back from allowing it on their platform. 1) Allowing Stadia onto the Switch could potentially discourage studios from porting their games onto the Switch itself. 2) Stadia would ultimately compete with Nintendo's own Nintendo Switch Online subscription. I sincerely hope that regardless of how this plays out, Nintendo feels pressured to quickly improve their subscription service and hastens the roll-out of SNES/N64/GBA titles in the near future. Nintendo coincidentally has also been future-proofing by working hard at cultivating strong relationships with indie developers. Where will the indie studios go when everyone else is switching to cloud streaming? Even if Stadia doesn't charge a discouraging premium for these studios to host their games on the platform, the nature of the beast will naturally funnel players to the most popular titles and franchises. Nintendo's console will become a perfect home to indie games for more than one reason in the near future. I can't even watch a 5 minute video on You Tube on the London Underground due to patchy service and it's even pain on mainline trains at times. No such problem with Switch and that also has what Stadia will never have...Nintendo games. @roadrunner343 Yep, until the Switch I wasn't even THINKING about gaming, it was just something I did when I was a kid. It's opened up a whole new passion for me, and my wife too (she's not nearly as nuts as me though lol), and I'm just stoked to be along for the ride and see what this console brings me. @Octane: Your comment made me laugh as old memories of dial-up tones played in my skull....Thank the stars for broadband. Great advertisements. I hope Nintendo starts something like this for their North American & European advertisements. The versatility of Nintendo Switch and the fact you can play it literally anywhere is incredibly appealing. Also, I'm not a fan of the all-digital, all-online that game companies are trying to push on us. The games aren't "yours" and you're tethered to an active internet connection to make them work. So what happens in a power outage? No gaming for you. But on Nintendo Switch, you can play as long as the battery doesn't run out (and even then you can plug it in to an external battery if you have one). You can play on public transit where internet signals might be weak or non-existent. You have CHOICE of digital and physical. And you're not at the mercy of a signal disruption. There are a lot of unforeseen issues going to an all-digital, always-connected future and I think people will be in for a rude awakening when the gaming industry becomes solely reliant on it. In the unlikely scenario that Stadia takes off to dominate, Nintendo is the only one of the big 3 in a position to ride the wave with it. Throw a Stadia app on Switch and they're good to go. I absolutely love the switch and play it everyday... but literally anything is better than what the switch has to offer for online multiplayer. Stadia is a nice idea that fails to account for the actual network infrastructure of one of it's biggest markets. Why would I invest in an always online, streaming service when my only choice of internet provider has a 1 TB cap on their service? Why would anyone in rural America choose this when they are lucky to have a viable 25 MB ISP, and most are depending on satellite/DSL for internet? I don't mind cloud gaming, but I also don't want that to be the ONLY option in the future. No thanks! I live in the U.S., so there's no way I'll be able to game in more remote areas via cloud gaming. Not unless ISP's stop capping data and add A LOT more places for coverage. Once Internet is free for everyone and is Super Strong, then I see it being a success XD! @AdamTendo "Let's all stop using Google and switch to Bing"
Gag "hurls" into the sink oh I missed it. Hey, no problem. I think something got lost in translation. Hope you’re comfortable and getting some gaming in at the weekend.